If you’ve read my blog and social media posts before, you know that I’m crazy about two things – food, and travel. This year I travelled half way round the world to Australia and have made a few stops in Europe and the Middle East too - but already I decided it was time to travel again. My destination? Hong Kong – The Pearl of the Orient. I'd always wanted to check out the looming skyscrapers and dazzling neon lights of Hong Kong so I booked my ticket and set out for 5 days of adventure. Here is my list of top budget things to do in Hong Kong in 5 days. When I landed in Hong Kong Airport, one of the first things I did was to buy an Octopus card. This is their equivalent to the Oyster card and is a super cheap way to travel around Hong Kong. I put on 200HKD (around £20) and it last me the entire time I was in Hong Kong. The cards can also be used for all types of public transport and can even be used to pay for purchases in 7/11s and other shops across Hong Kong! It is easy to navigate your way around Hong Kong, there was MTR stations and exits everywhere, and the trains themselves are roomy and regular. Hong Kong is known as a shopper’s paradise with an array of markets dotted around. I travelled to Temple Street Night Market, a popular bazaar located in Kowloon. This market had everything I had hoped for – cute little trinkets such as earrings and clutch bags, authentic ceramic tea pots and cups, jade jewellery, bags, cashmere scarfs, electronics, and so much more. Haggling is expected so prepare to negotiate for every purchase. I love haggling so I definitely was in my element and a highlight was managing to get 2 cashmere scarfs for 70HKD when one was priced at 90HKD. The market owner even shook my hand for my haggling skills! I went to this market soon after landing so I was pretty jet lagged and went back to the hotel after a few hours. If I had more energy I definitely would’ve checked out the Ladies Market, which has over 100 stalls and gets its name from the vast variety of clothing and accessories on sale for women of all ages. There are also watches, cosmetics, bags, and CDs so there is something for everyone. I will definitely have to check it out when I return one day! Checking out the Big Buddha was definitely the highlight of my trip. Thinking that Hong Kong was a concrete jungle filled to the brim with skyscrapers, the visit to the Big Buddha showed me that there was much more to this enchanting place than meets the eye. 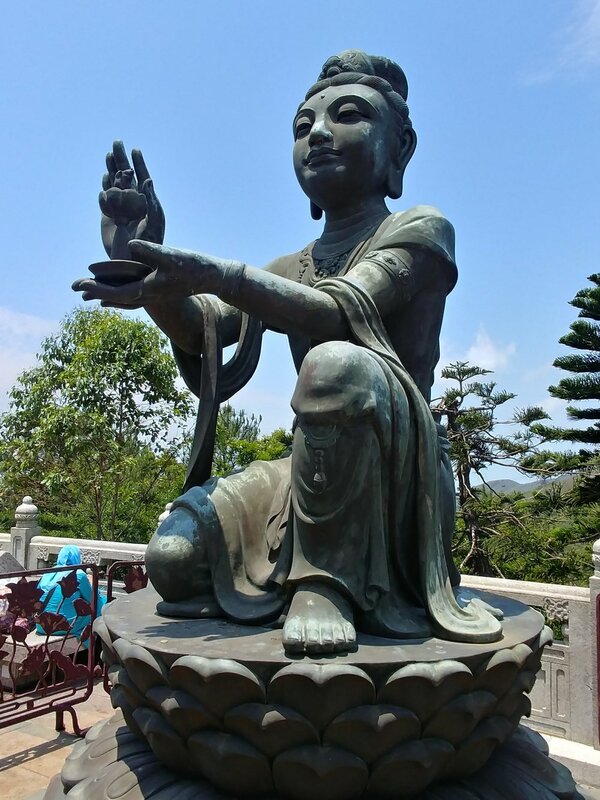 Formally known as the Tian Tan Buddha statue, it was erected in 1993 and sits 34 metres high in the mountains of Lantau Island. I took the cable car up which was quite reasonable at 210HKD for a return ticket and gave me the chance to see the breathtaking views of Lantau Island. If you are a bit adverse to heights be prepared as the cable car did stop a few times due to ‘technical errors’ and big gusts of wind did not help matters! The Buddha itself is just an incredible sight to behold. As the cable car got closer, I was in awe at how huge it really was. 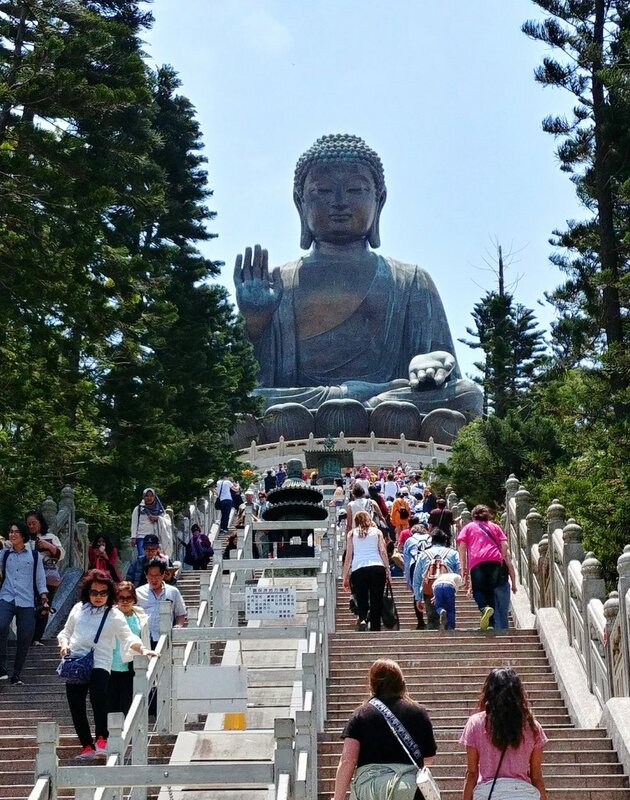 I'd walk the 268 steps for a closer look at this impressive statue, and to enjoy the panoramic views of mountain terrain and sea that can be seen from the top. 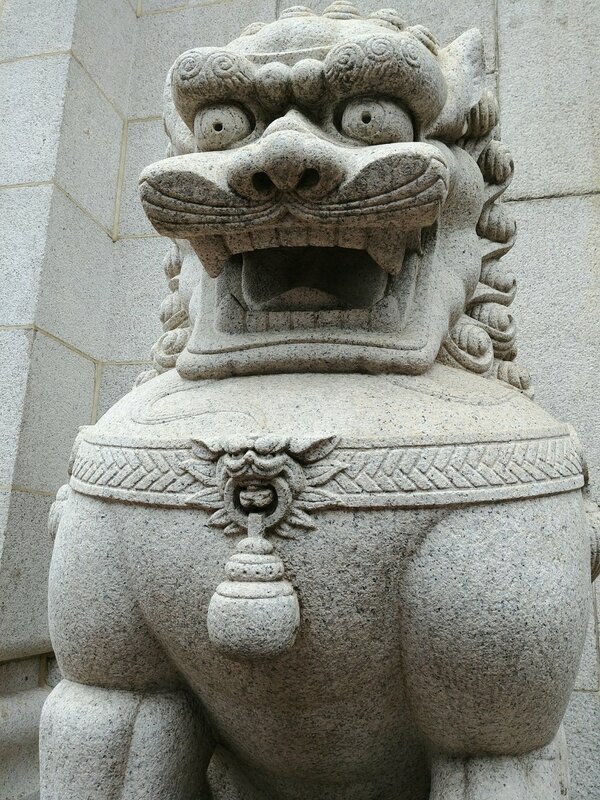 Do also check out the Po Lin Monastery for a glimpse of the devout monks chanting in zen-like unison. The monastery is rich with colour and smells of incense, and even has a peaceful pond filled with giant koi carp. 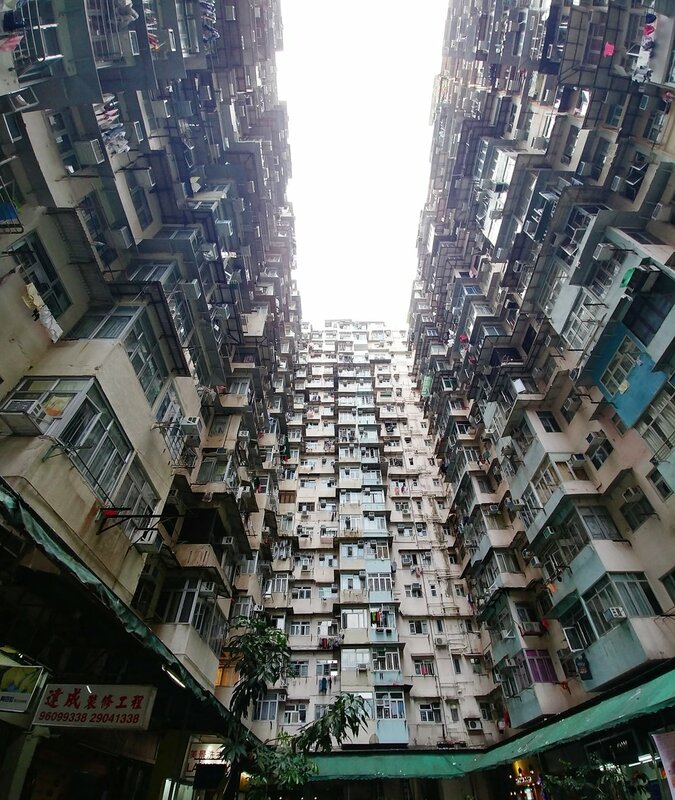 If you thought that London had an impressive skyline you’d need to think again once you check out Hong Kong’s collection of giant skyscrapers. The view of Hong Kong Island from Tsim Sha Tsui Promenade across the river is quite simply breath-taking and is even more impressive at night. Since 2004 the buildings also come alive with light as the world's largest permanent light show takes place for 15 minutes each night from 8pm. I have to admit I thought the lights were quite disappointing but even if this is the case the skyline itself is impressive just on its own. If you want to experience the best views of one of the world’s most spectacular cityscapes of the Hong Kong skyline from above, you need to check out Victoria Peak. The highest point on Hong Kong Island, it is without doubt one of the most popular attractions in Hong Kong. Take the Peak Tram to the top, which is an experience in itself! You can use your Octopus Card and it’s very affordable, allowing you to climb up above Hong Kong and its glorious scenery at amazing angles! If you’re lucky and go on a day of clear blue skies, you’ll get to see the skyline in all its glory along with the green hills of the New Territories. However, if you go in the early evening you’ll witness a dazzling display of lights from the best viewpoint in Hong Kong as the sun sets across this great land. Whilst walking casually around Hong Kong on a clear sunny day, I was quite lucky to find myself in the Zoological and Botanical Gardens, the oldest park in the territory. There are quite literally acres of trees and flowers dotted around these gardens along with cooling fountains and even an aviary filled with rare birdlife. I didn’t go into the zoo itself but from the outside I could see monkeys, orang-utans, and even flamingos! After visiting Ascot Races last year and winning (out of pure luck I must add) I knew that I had to visit Happy Valley, Hong Kong’s Racecourse and one of the most famous horse racing venues in the world. Horse racing in Hong Kong. First introduced by the British upon arrival in Hong Kong in 1841, it has become a major attraction, for both the locals and for the thousands of tourists who attend each year. Having been wowed by the sheer size and scale of Ascot, I was equally impressed by Happy Valley and how traditionally British it felt being in the venue surrounded by thousands of punters. Even if you don’t like horse racing it’s a great experience and at 10HKD to get in it’s super cheap and well worth a punt! I’d also recommend checking out the Lan Kwai Fong area as it is filled with various bars, restaurants and clubs and is Hong Kong’s equivalent to Soho with people from the surrounding offices of central crowding the streets at night. Kennedy Town is also a nice area for just getting lost in and exploring the variety of international cuisines, the area has to offer – definitely one for the dedicated foodie! These are my top things to do on a budget in in Hong Kong - what are your favourite things to do in Hong Kong? Special thanks to Hong Kong Tourism board for all their support.